First, in introduction, I would like to give my congratulations to those who love VirtueMart and have searched for a Joomla template that fully supports its style. I can definitely say that "Your search finishes here", JSN Kido is the first JoomlaShine template which applies VirtueMart's style with our own amazing design. 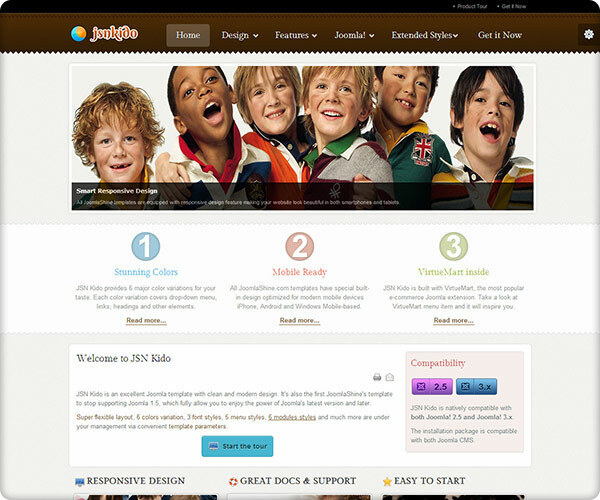 JSN Kido is a lovely Joomla 2.5 & 3.0 template which is good-looking. This template would be a great choice for any e-commerce website. Want to discover more about JSN Kido? Fully supports and has specific style for VirtueMart. Responsive design lets you enjoy the template on any browsers beautifully. Flexible layout with various fonts, menus and module styles. Native compatible with Joomla 2.5 and Joomla 3.0. After finishing our survey about what extensions JoomlaShine customers would like to be supported by our templates, the highest choice was for VirtueMart. So we decided to build JSN Kido specifically for fashion and shopping websites. All the VirtueMart components, such as Products, Products Category, Orders, Payment Methods, etc. work well with JSN Kido. 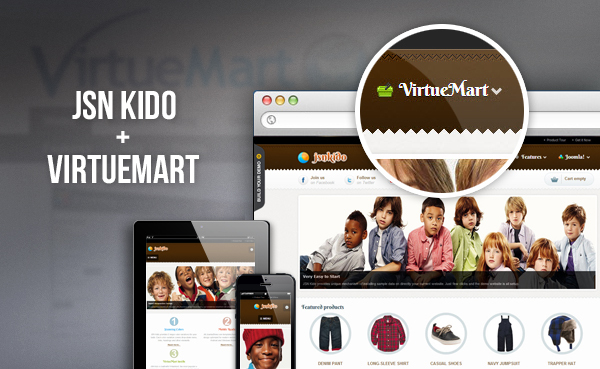 All VirtueMart components look more beautiful and eye-catching than ever when you use VirtueMart with JSN Kido. Are you interested in JSN Kido and would like to test it before purchasing? Feel free to use our DEMO BUILDER, which you can find with any of JoomlaShine's template demos.